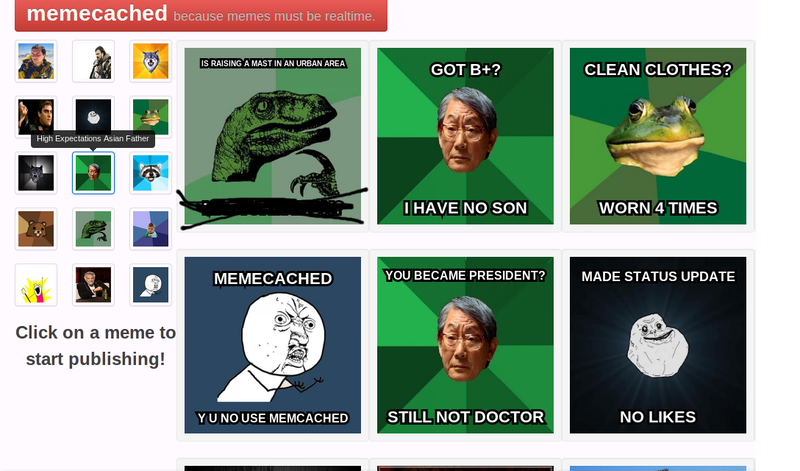 Yesterday, I wrote a web-app named Memecached. It is a service which allows you to quickly generate a meme and publish it in real-time. It went viral for quite a few hours after I tweeted about it and posted it on Hacker News, with hundreds of memes being shared, sometimes a new meme every three seconds! Using it is fairly trivial – you open the page, and the latest N (25 by default) memes are streamed back and populated into the webpage. On the left is a collections of meme templates – you can click any one, enter the top and bottom text, and hit publish to see it reflected on each open client. On the server side, the now.js initialization didn’t work normally as sometimes the client – my chrome browser – would not perform a handshake (I’ve reported this in the now.js issue here: , so I had to fiddle around with the options till I found that xhr-polling seemed to work. All meme template images are stored on Dropbox. When a new meme is published, the server takes a JSON object from the client, containing the meme name and text. No image whatsoever. The received meme object is inserted into the mongo collection memes with a date timestamp added to it. The object is also sent to all connected clients immediately so that they may update their timelines. This also means that no further database queries are required to retrieve new memes. When a client connects, the last few (25) memes are queried from the database and sent back. This can further be optimized by having an in-memory queue of the most recent memes, in addition to the database. All meme generation is done entirely client-side, by drawing the text over the images using Canvas. The client doesn’t have to download images, and the server doesn’t have to handle them at all. First, run mongod to start the Mongo daemon. Point your browser to http://localhost:8080. Upvotes/Downvotes: This should be a ten-minute job. Just add two new keys to the ‘schema’ of the doc. Sharing: Memes are rendered in Canvas. Need to get the dataUrl() and allow the user to save the image to a file. Line breaks: There need to be line breaks in a meme phrase. Right now, extra long sentences will make the font shrink too much to be visible.